French actor Gerard Depardieu, visiting Grozny to film a new movie, said the ethnic Chechen brothers accused of the Boston bombing had been raised American and that residents of Chechnya were not to blame. The actor, who accepted Russian citizenship after quitting France to avoid a planned 75 percent tax on millionaires, was echoing comments from Chechen leader Ramzan Kadyrov, with whom he has been filmed socializing. "I was in the United States when the terrorist act was carried out in Boston. 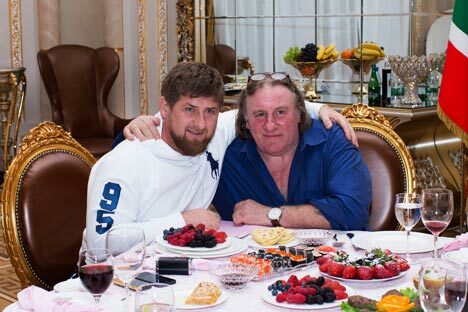 I agree with Ramzan Kadyrov, who said that the Tsarnaev brothers have a Chechen last name but their upbringing is American," Depardieu said at a news conference on Grozny on Tuesday. "You [Chechens] don't carry any responsibility," said Depardieu, who was in Chechnya to shoot a movie. The movie, "Turquoise," which also stars British actress Elizabeth Hurley, is being filmed in Chechnya and Moscow and will debut late this year. In the film, Depardieu plays the role of a man whose son is killed and who comes to Russia to avenge him, meeting up with an old flame (played by Hurley) in Moscow and a Chechen friend along the way. "Turquoise" is being directed by French filmmaker Philippe Martinez and produced by Arnaud Frilley, who previously made a film starring Depardieu about Russian mystic Grigory Rasputin. Filming began in Chechnya on Saturday. Depardieu, flanked by Frilley and Hurley at the news conference, also said that he plans to learn the Russian language now that he is a Russian citizen. "I travel across the entire world, meet many Russians, though I don't speak Russian, which I'm going to learn now," he said. Depardieu is no stranger to Chechnya, visiting Grozny last October for Chechen leader Ramzan Kadyrov's 36th birthday, where he declared: "Glory to Chechnya! Glory to Kadyrov!" When the actor visited the city again in February after receiving his Russian passport, Kadyrov gave him an elite five-room apartment in a Grozny skyscraper. Depardieu obtained a permanent residence permit in Mordovia, central Russia, in February. On Tuesday, a senior Mordovia official, Valery Maresyev, commented on a media stir caused after Depardieu was spotted riding in a car with flashing lights in Saransk, Mordovia's capital. Maresyev said Mordovia's governor, Vladimir Volkov, had given the French actor a ride because they were both had been heading to the same event. There has been rising public anger in Russia over flashing lights, which have come to epitomize the impunity afforded to businessmen and state officials who use them to bypass traffic rules.